MILWAUKEE - (Nov. 17, 2016) - Johnson Controls will showcase several innovative new technologies at the 2017 AHR Expo, January 30 to February 1 in Las Vegas (booth numbers C2929, C3124 and C3329). The technologies include Verasys™, YORK® YVFA chiller, YORK EcoAdvance, BlueStream™ Hybrid Cooling System and VRF Smart Gateway. The YORK YVFA free-cooling air-cooled screw chiller is a finalist in the Cooling category of the 2017 AHR Expo Innovation Awards competition. Available in nominal sizes 150-450 yielding more than 600TR (2110kW), the YVFA provides the industry with the first AHRI-certified, integrated variable-speed drive (VSD) screw chiller with free cooling. The chiller’s advanced technologies include VSD compressors that ensure efficient operation across all cooling-load and ambient temperature conditions. 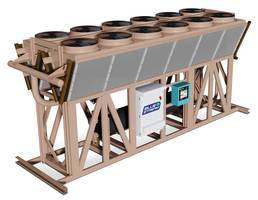 Its integrated high-efficiency, air-to-air liquid free-cooling coils reduce or eliminate the need for mechanical cooling when ambient conditions allow, and intelligent controls optimize energy use year-round, constantly evaluating conditions and controlling bypass valves to reduce pump energy when free cooling is not available. An industry first, the Johnson Controls VRF (Variable Refrigerant Flow) Smart Gateway provides unprecedented control for network management centers. Offering fast, simple integration into the Metasys® building management system, the small yet powerful gateway brings data for all YORK VRF components into a building management system for comprehensive control of the entire system. Data is available in any format and on-demand from any connected device. The VRF Smart Gateway works over Ethernet to discover all data points from YORK VRF indoor and outdoor units. In addition to the new technologies being launched at AHR Expo, Johnson Controls will feature a presentation theater, where subject matter experts will present on a variety of industry-related topics. For more information, visit booth numbers C2929, C3124 and C3329 or the Johnson Controls website at www.johnsoncontrols.com. Johnson Controls is a global diversified technology and multi industrial leader serving a wide range of customers in more than 150 countries. Our 135,000 employees create intelligent buildings, efficient energy solutions, integrated infrastructure and next generation transportation systems that work seamlessly together to deliver on the promise of smart cities and communities. Our commitment to sustainability dates back to our roots in 1885, with the invention of the first electric room thermostat. We are committed to helping our customers win and creating greater value for all of our stakeholders through strategic focus on our buildings and energy growth platforms. For additional information, please visit http://www.johnsoncontrols.com. Johnson Controls’ Building Technologies & Solutions has an unmatched portfolio of HVACR products and solutions to create more comfortable, safe and efficient buildings. Operating in more than 150 countries through a strong network of distribution channels, Building Technologies & Solutions’ breadth of offerings help building owners, operators, engineers and consultants impact the full lifecycle of a building. Its market leadership is established through trusted brands such as YORK®, Sabroe® and Metasys® as well as its smart building integration capabilities and energy financing solutions. For more information, visit www.johnsoncontrols.com.